Beyonce has a song out with one of rap's biggest superstars. Rapper Eminem released a single Friday, featuring Beyonce. 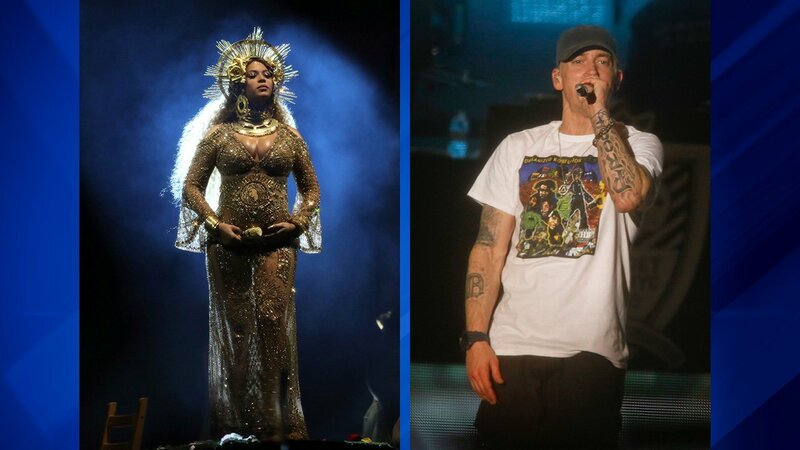 "Walk on Water" has Queen Bey singing, "I walk on water/But I ain't no Jesus/I walk on water/But only when it freezes" -- as Eminem spits bars about the pressures of his life and career. If you listen closely, you can hear the sounds of Eminem writing and ripping up paper in the background. The artist born Marshall Mathers hinted on social media earlier this week that something was coming, posting a photo of a prescription pad that read "Revival. 'Walk on Water' take as needed." He followed that up with a parody of a drug commercial for Revival, which gave followers a heads up to an arrival at noon on Friday and directed them to AskAboutRevival.com. Fans have been eagerly awaiting new music from the rapper, whose last studio album was "The Marshall Mathers LP 2" in 2013. Eminem is scheduled to perform on "Saturday Night Live" on November 18.